The Bills have signed running back TJ Yeldon to a two-year contract. Yeldon hoped to cash in this off-season with a long-term contract with a big guarantee. While terms of his deal haven't been disclosed, it's safe to say he's disappointed with how his market failed to materialize and forced him to settle for just a two-year deal. This is a sneaky pickup for the Bills, who now have LeSean McCoy, Frank Gore and Yeldon in the backfield. While Yeldon has never been a dynamic runner (he's averaged right around four yards per carry during his four year career in Jacksonville), he's caught 171 passes and proven to be more than capable out of the backfield. This is a signing that's likely more valuable in reality than fantasy, but Yeldon still carries sleeper value. After all, Gore is 35 and McCoy is 30. This signing could indicate the Bills are going to go with a full-blown committee or even looking to move McCoy, as they have in the past. Yeldon (RB48, overall ADP of 115), McCoy (RB47, ADP of 127) and Gore (RB83, ADP of 240) will likely need to be separated or have an injury occur for their ranking or ADP to increase. Demaryius Thomas has inked a one-year deal with New England that could pay him up to $6 million. A classic New England move if there ever was one, the Patriots are taking a flier on yet another veteran who may or may not have anything left in the tank. Thomas was a dynasty league staple in lineups for the better part nearly a decade, amassing 688 catches, 9,330 yards and scoring 62 touchdowns in 132 career games (all but seven of those with Denver). After being traded to Houston last season, the former All-Pro ruptured his achilles and the Texans opted not to bring him back at a robust $14 million he would've been owed this season. At 31 years of age, Thomas clearly believes he has something left to give, but the currently unknown guaranteed money is going to be a key here - if New England failed to give him much in terms of guarantees, it's quite possible they're just going to wait and see how his recovery goes and aren't saving a spot for him on their 53-man roster. If there are some solid guarantees, they clearly believe he can help. Currently our WR66 with an ADP of 235, this news is going to vault Thomas back on the dynasty radar. However, if you have an owner who believes Thomas is poised for a massive comeback (his pre-injury deterioration and recovery from this most recent injury make that a clear long shot even after New England lost Rob Gronkowski and Chris Hogan this off-season), it's time to move him. It's a 4-year, $140M deal with a $65M signing bonus and a no-trade clause. The deal came in a mere half-hour before the Wilson-imposed deadline. Wilson has been a pillar of performance and high-values since entering the league in 2012, throwing for at least 30 touchdowns in three of the last four years though 2018 did see a decline in both passing and rushing yardage. In 2018, Wilson only finished as the QB10 in fantasy, largely due to bigger numbers by quarterbacks around the league in combination with slowly eroding production behind a fading offensive line and sub-par receiving corps. It remains to be seen if the Seahawks will upgrade both of these deficits in the upcoming draft. But for Russell Wilson fans, it's a great day in that the hometown hero will remain in Seattle for the foreseeable future. He's found as DLF's QB7. Delanie Walker said he remains without a timetable for return as he continues recovering from an ankle injury suffered in week one. Anyone who recalls the injury, recalls it was of the gruesome variety. Walker will turn 35 shortly before kickoff of the 2019 season and it's uncertain if he'll be hampered by the ankle, though all signs point to the Titans simply taking it slow with the veteran. Even before his 2018 campaign ended, his numbers had been showing signs of a downward trend and he only tallied three touchdowns in 2017, less than half his 2016 production of seven. Tight ends have been extending their careers of late and Walker should resume his TE1 role in an offense sorely needing receiving weapons. Walker's TE1 role in fantasy, however, is likely behind him now but he may still salvage upside TE2 value as long as he remains healthy and hasn't lost his downfield dynamic. He's found as DLF's TE29 and his ADP (203) is just off his career low. The Panthers signed Chris Hogan to a one-year deal. 7/11, as he was once dubbed early in his career with the Dolphins (due to always being open), knew the Patriots wouldn't be bringing him back and he was free to sign elsewhere. Ultimately, a market never transpired for the 31 year old veteran so he had to settle for a one-year deal with the Panthers. Hogan saw a rise in value heading into 2018 with Julian Edelman suspended but he never broke through and only amassed 532 yards and three touchdowns on 35 receptions. The yardage total was his second-highest in a career that started in 2013 and he's never totaled more than 41 receptions in any season. With DJ Moore and Curtis Samuel locked in as starters, Hogan will fight for a chance to start on the outside but doesn't project as anything more than a last-flex start in emergency situations at best if he sticks on the roster heading into regular season. Hogan is found as DLF's WR75. The former receiver turned running back was a once the starter in Green Bay, but fizzled out before being dealt to Baltimore. If you recall, it was Montgomery who inexplicably returned a kick out of the end zone only to fumble it away in a crucial game last year for the Packers. Two days later, Green Bay shipped him out of town. Montgomery was a bit of a bust in Baltimore as well, rushing for just 83 yards on 15 carries and catching only ten passes in his six games as a Raven as well. In New York, Montgomery will presumably back up Le'Veon Ball and also be used in special packages as a receiver. While it's possible our current RB65 could regain some value, he's also clearly going to be an afterthought in the Jets backfield. At this point, Montgomery looks like a handcuff for Bell owners and a dynasty roster clogger for others. It's a fantastic deal for a receiver who has never eclipsed 900 yards receiving. With Odell Beckham Jr. now in Cleveland, the Giants had to ensure their top receiver stayed in New York, though it would seem they overpaid greatly to accomplish that. In three years, Shepard has amassed 190 receptions for 2,286 yards and 14 touchdowns. He'll be the odds-on favorite for targets in 2019, though sophomore runner Saquon Barkley may challenge. Operating as the certain WR1, there exists a long runway for Shepard to finally surpass the 1,000 yard plateau and his career-high of eight touchdowns (scored as a rookie) may serve as the over/under - Shepard has only six over his past two seasons. Sterling Shepard is currently found as DLF's WR40 and his ADP (97) had been eroding until Beckham's trade this off-season. There's simply too much risk to acquire Shepard for dynasty owners believing there's upside to his current ranking. With a fading Eli Manning at the helm and no other established receiving threats outside of tight end Evan Engram, all signs point to another poor season for the G-men in 2019. The Patriots have signed tight end Austin Seferian-Jenkins to a one-year contract. The Patriots flirted with Jared Cook, but he ultimately chose to play in New Orleans, leaving New England to pursue another avenue to replace the newly retired Rob Gronkowski. They have seemingly settled on ASJ for the time being. Seferian-Jenkins was the best tight end on the market, but that's really not saying much. Despite showing flashes throughout his five year career, ASJ has never completed a season healthy and has played in more than nine games just once during that span. The former second round pick has undeniable talent, but his health history makes him a potential "sell high on the hype" player in dynasty leagues, You can spin this however you want, but the bottom line is ASJ is no Rob Gronkowski. His current ADP as the TE27 will surely rise, but this may be your best time to cash out for a second or third round rookie selection. The Browns acquired Kareem Hunt in the off-season leaving fantasy owners wondering what to expect in 2019 for sophomore Nick Chubb. Washington trading with Arizona for Josh Rosen is looking more likely as we near the NFL Draft. Head coach Jay Gruden seems to be on the "win now" train and with the Arizona Cardinals smitten with rookie quarterback Kyler Murray, the table is set for a draft day trade. The Redskins hold the 15th selection in the upcoming draft and while they may have their eyes fixed upon one of this year's rookies, it seems as though they also have Rosen in their sights as well. Rosen struggled as a rookie with Arizona though the blame isn't purely on his shoulders. The injury bug played a large role and the Cardinals regressed badly with few receiver targets outside of the aged Larry FItzgerald. For his part, Rosen completed only 55% of his passes for 2,278 yards, 11 touchdowns to 14 interceptions. While Washington would be an upgrade for Rosen and his fantasy owners, It's hard to predict much upside for the sophomore quarterback who would see his second offensive coordinator in two years. Josh Rosen is found as DLF's QB23 and his ADP (218) is leveling off following a steep decline. Rosen is best treated as developmental quarterback until he proves otherwise. The Ravens have recently held workouts with Eddie Lacy and Josh Jacobs. While the Ravens are likely doing their due diligence with Lacy, the Jacobs visit is very interesting, especially to owners of Mark Ingram. It seems apparent the Ravens are serious about finding a new backfield mate for him and that could cause a serious ding to his dynasty value. Ingram's March ADP of 93 is sure to rise after leaving New Orleans for Baltimore, but this news could limit just how much it rises in April. Stay tuned on this front or move Ingram at what could be his highest dynasty point in quite some time if you're convinced this isn't a smokescreen by the Ravens. The Bengals have released running back Mark Walton. Walton has been arrested at least three times over the past few months and even the ever-patient Bengals franchise had seen enough. Walton was a rookie sleeper out of Miami last year, but saw very little time behind Joe Mixon last year. After misdemeanor arrests for battery and marijuana possession, Walton hit the trifecta with a felony arrest for carrying a concealed weapon, marijuana possession and reckless driving. It's quite possible Walton's career may be over before it even started. He looks like a drop in dynasty leagues. The Raiders signed Ryan Grant to a one-year, $2.5 million deal. Grant was a bust in Indianapolis last year as he posted just 35 catches for 334 yards and one touchdown after inking a one-year deal worth $5 million. The Colts had seen enough and didn't want him back this season, so the Raiders pounced and found a replacement for the departed Seth Roberts. Grant is the WR94 with an ADP of 239 - it's unlikely that rises much as he'll now compete with Antonio Brown and Tyrell Williams for targets. He's no sure bet to make the team and would have dynasty value if he cracks the 53-man roster and wins the slot receiver job, which at this point has to seem rather unlikely. Grant is not a priority pickup at the moment. Seth Roberts and the Ravens have agreed to a one-year deal. Over his four years in Oakland, Roberts was very up and down on a game-to-game basis, but oddly averaged around the same numbers each and every season. With anywhere between 32 and 45 catches, 397 and 494 yards and one to five touchdowns in each of those four seasons, he was the definition of average. At this point, it looks like he'll have a role on the Ravens with just Willie Snead and Chris Moore left to gobble up targets after the departures of John Brown and Michael Crabtree this off-season. It's a fairly uninspiring move for Baltimore, but they're clearly expected to address the position in the off-season. Roberts could find himself on the ADP map, but it seems unlikely, despite a positive landing spot. Fuller is a big-play threat who has been consistently productive when on the field. The problem being that Fuller has fallen to injury in all of his three years in the NFL, limiting his time on the field. In 2018, he suffered a torn ACL and appeared in only seven games. In three years, Fuller has logged only 31 games but has scored in 13 of them. A first round selection (21st overall) in 2016, if Fuller can remain off the trainer's table in 2019, he stands to be an extremely productive WR2 across from top receiver DeAndre Hopkins. That's a big "if" but not out of the realm of possibility. Despite his most recent setback, his ADP (73) remains stable and he's found as DLF's WR30 showing that hope springs eternal once again. Alfred Blue has signed a one-year contract in Jacksonville. The soon-to-be 28 year-old will take on the role of veteran backup to the enigmatic Leonard Fournette in 2019. The Jaguars also have Thomas Rawls and David Williams on the roster but Blue should easily slot in ahead of both as Fournette's primary change-of-pace option. The bigger question here is Fournette's ultimate fate in Jacksonville following the dramatic events which closed out the 2018 campaign, when VP of Football Operations Tom Coughlin called out Fournette and fellow running back T.J. Yeldon for "disrespectful" actions while sitting alone on the bench during the final week of the season. All signs point to the parties involved clearing the air and Fournette carrying the load in 2019, barring further injury, with Blue receiving a handful of carries in relief. Alfred Blue will remain a weak handcuff in case of injury, at best, and is found as DLF's RB98. The Detroit Lions have reached an agreement with running back C.J. Anderson on a one-year deal. The backfield in Detroit is getting crowded with Anderson joining sophomore Kerryon Johnson, veteran third down specialist Theo Riddick and the scrappy-but-productive Zach Zenner. The one-year contract will allow the recently-turned 28 year-old to showcase his abilities once more in hopes of landing a more lucrative deal in 2020. After showing well for the Rams following a knee injury suffered by Todd Gurley, Anderson ran wild and seemingly was on track to be a hot commodity in the free agent market in 2019. That never transpired and Anderson now finds himself as the backup to Johnson, who appears to be in line for less of a workload in order to preserve his health. Anderson's lone 1,000 yard season came in 2017 when with Denver and he was summarily shipped to Carolina in 2018. Following nine games as a Panther, he eventually found his way to Los Angeles where he ran for nearly 300 yards along with two touchdowns in his final two regular season games, followed by further production in the playoffs. It's a bit of a head-scratching move, especially for Anderson, though it's not out of the question that he splits early-down duties with Johnson. Think of him as an upside RB4 in dynasty until he proves otherwise. He won't carry enough value to sell but there is sleeper potential as an acquisition target. You'll find C.J. Anderson as DLFs RB58. Marlon Mack primed for big season? This goal will highlight the skills of Marlon Mack who, even with a nagging hamstring injury, was able to compile 908 yards and nine touchdowns on 195 carries. Now healthy and running behind a dominant offensive line, Mack should benefit greatly from being fully healthy and, especially, being the focal point of the rushing attack. The Colts haven't added significant competition yet in the off-season and while they are expected to address the position via the NFL Draft, a healthy Marlon Mack will be difficult to unseat in 2019. He's currently found as DLF's RB21. Allison suffered a trio of injuries in 2018 including a concussion, a hamstring and eventually was lost for the season to a torn adductor (pelvis) muscle. Without injury, his extrapolated 2018 season projected at 76 receptions, 1,156 yards and eight touchdowns. The Packers have moved on from slot receiver Randall Cobb, now with the Cowboys, and Allison doesn't possess prototypical slot size at 6'3/202 lbs. but the Packers are flush with good size at the position and Allison's skill-set seems best fitted for the slot role though could line up outside if called upon. Proven starter Davante Adams is the clear WR1. Also in the mix are last year's rookies J'Mon Moore, Marquez Valdes-Scantling, Equanimeous St. Brown but Allison should have the inside track as a starter and, if he can remain injury free, will provide upside potential at an intriguing value. Allison is currently found as DLF's WR71 which looks like a bargain heading into 2019. Jordan Howard has been traded to the Eagles for a 2020 sixth round selection which can be upgraded to a fifth round selection. The only unknown for Howard was which team's jersey he'd be wearing in the coming weeks and now we know. It's a good landing spot for the non-PPR back though the Eagles are not exactly barren at the position. Howard will slot in as an early down, between-the-tackles runner and offers little in the way of third-down or PPR production ability. Still only 24 years of age, Howard never found his groove in Matt Nagy's offense and his move has been long expected. The Eagles are certain to allow both Jay Ajayi and Darren Sproles to walk in free agency while they still possess Wendell Smallwood, Corey Clement and Josh Adams with Adams taking the biggest hit in fantasy value. Howard should immediately sit atop the depth chart and allow the Eagles to bypass the position in early rounds of the NFL Draft in late April. Howard failed to reach 1,000 yards for the first time in his career in 2018 though he matched his 2017 mark of nine touchdowns. Both marks should be within reach in 2019. 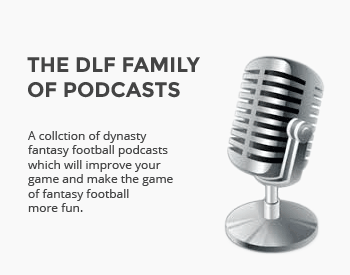 Jordan Howard is found as DLF's RB28.